LUXEMBOURG, December 22, 2011 (ENS) – United, Continental and American Airlines and their trade association have failed to block a European Union law that charges airlines flying to EU destinations for their greenhouse gas emissions. The Court of Justice of the European Union ruled Wednesday that the EU law that brings aviation activities into the EU’s emissions trading scheme is valid. “Application of the emissions trading scheme to aviation infringes neither the principles of customary international law at issue nor the Open Skies Agreement,” Europe’s highest court decided. In 2003, the EU decided to set up a scheme for greenhouse gas emission allowance trading, as a central element of European policy to combat climate change. Initially, the system did not cover greenhouse gas emissions from air transport. 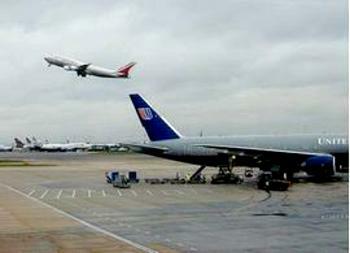 But a law passed in 2008 provides that aviation activities will be included in that scheme from January 1, 2012. From that date, all airlines, including those of third countries, must acquire and surrender emission allowances for their flights which depart from and arrive at European airports. Claiming the EU measures impose a form of tax on fuel consumption, in 2009, the airlines and their trade association, Airlines for America, challenged the legality of measures in the UK transposing the EU’s Aviation Directive into UK law. They claimed infringement of international law and the EU-U.S. Open Skies agreement, the Chicago Convention and the Kyoto Protocol. The High Court of Justice of England and Wales asked the European Court of Justice whether the directive is valid in the light of those rules of international law. The European Court of Justice, which has one judge for each of the 27 EU Member States, confirmed the validity of the directive that includes aviation activities in the emissions trading scheme. “The court did not fully address legal issues raised and has established a damaging and questionable precedent by ruling that the European Union can ignore the Chicago Convention and other longstanding international provisions that have enabled governments around the world to work cooperatively to make flying safer and more secure, and to reduce aviation’s environmental footprint,” Airlines for America said in a statement. A4A is part of an international, industry-wide aviation coalition that has proposed the adoption of a global sectoral approach by the International Civil Aviation Organization, the United Nations body charged with setting standards for international aviation. In October 2010, ICAO adopted a resolution with targets and principles broadly consistent with the industry’s approach. The coalition’s six participants include three U.S.-based groups: Center for Biological Diversity, Earthjustice, and Environmental Defense Fund; and three European groups: Aviation Environment Federation, Transport and Environment, and WWF-UK. All six groups are intervenor-defendants in the litigation. Aviation is one of the fastest-growing sources of greenhouse gas emissions, rising three to four percent per year. Until now, the sector has escaped regulations that would require emissions reductions.